Please note: This event has been postponed and will likely be rescheduled in the fall. Get ready for explosive chemical reactions, hair-raising electric charges and other scientific spectacles. 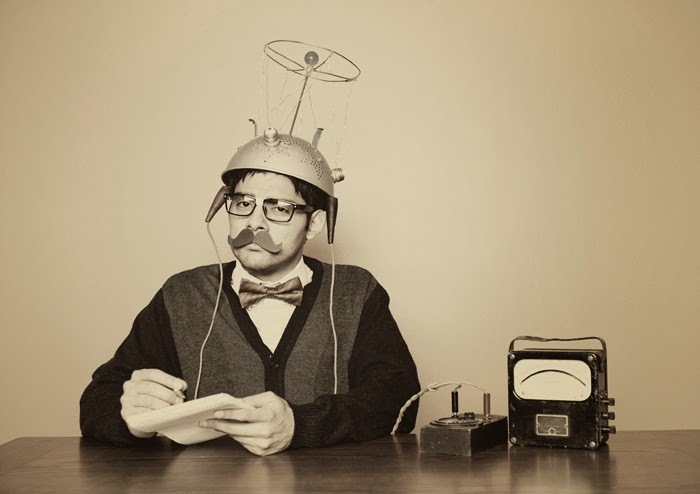 The So You Think You Can Science? event is coming to Douglas College. As part of the fun competition, six teams will present entertaining and educational science-themed demonstrations. Audience members will then pick the winner as part of a reality TV-style vote. Hosted by the Faculty of Science and Technology, the contest will feature teams of students, faculty and staff from several departments. The free, public event takes place in the Laura C. Muir Performing Arts Theatre on the New Westminster campus on Thursday, May 15, 1-2pm. Email sawyerm@douglascollege.ca to reserve seats. Tim Frick coaching during the Beijing 2008 Paralympic Games. A longtime Douglas College instructor and legendary wheelchair basketball coach has received the country’s highest sporting honour. Tim Frick has been inducted into Canada’s Sports Hall of Fame. 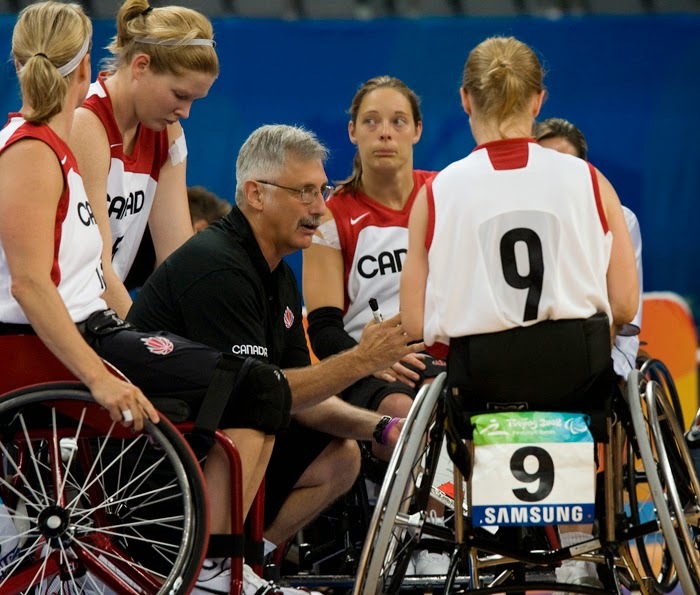 From 1990 to 2009, Frick served as head coach of the Canadian Women’s Wheelchair Basketball Team. During his tenure, the team won three Paralympic gold medals and four world championship titles. Frick has been widely celebrated for his accomplishments as a coach. Among a host of previous honours, he has been inducted into the Canadian Paralympic Hall of Fame and the Wheelchair Basketball Canada Hall of Fame. Frick, 61, retired as an instructor of Sport Science and Bachelor of Physical Education and Coaching at Douglas College in 2009. He lives on Pender Island. Meet Britt MacDuff, a Douglas College Performing Arts grad. Britt talks about her time at Douglas and how it sparked her interest in writing a children's book. More information about the Faculty of Language, Literature and Performing Arts is available on the Douglas College website. 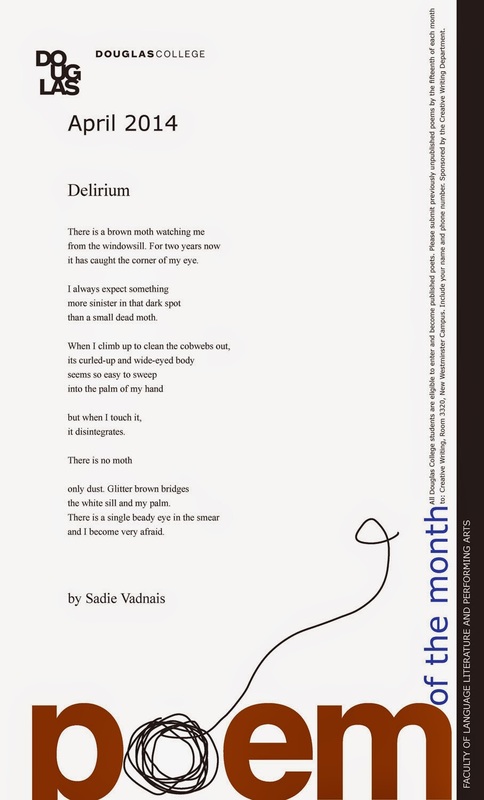 Click on the image to the right to see an enlarged version of this month’s poster, featuring "Delirium” by Sadie Vadnais. 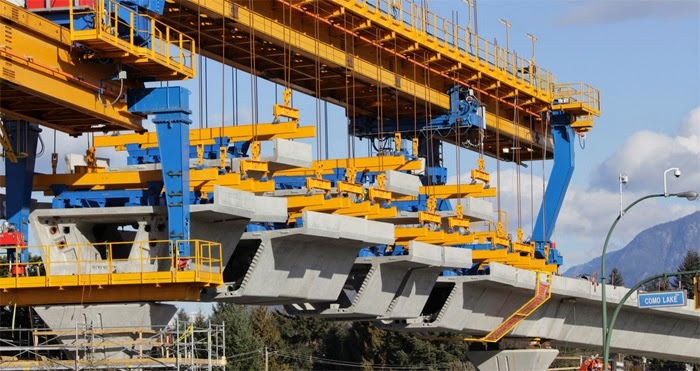 To keep pedestrians moving safely, sidewalk closures and detours will be in effect as construction of the Evergreen Line takes place near the Douglas College Coquitlam campus. Several areas will be affected along Pinetree Way between Town Centre Boulevard, next to the campus, and the transit exchange at Coquitlam Station, where Pinetree Way meets Lougheed Highway. The EGRT Construction website has details about the pedestrian traffic changes and additional vehicle traffic changes. The sidewalk closures and detours are in effect until spring 2015. Once in service, the Evergreen Line rapid transit route will link the Coquitlam campus and the SkyTrain station at Lougheed Mall. For more information about the project, visit the Evergreen Line website. Douglas College held another successful Student Research Day on April 1 with dozens of project displays filling the New Westminster campus concourse. Students from a variety of programs were on hand to explain their research on topics covering health, science, technology, the environment and more. For a look a what the event was all about, check out the clips below of students talking about their research. 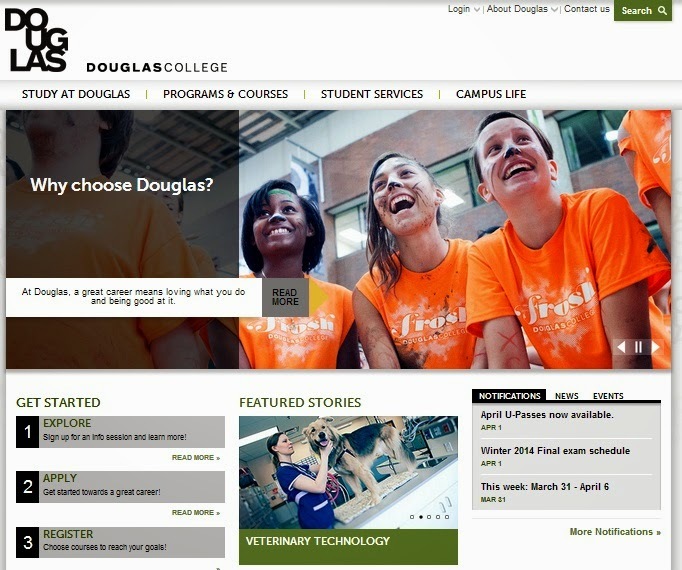 Douglas College's homepage has a new look. Douglas College has launched a new website to improve your online experience. 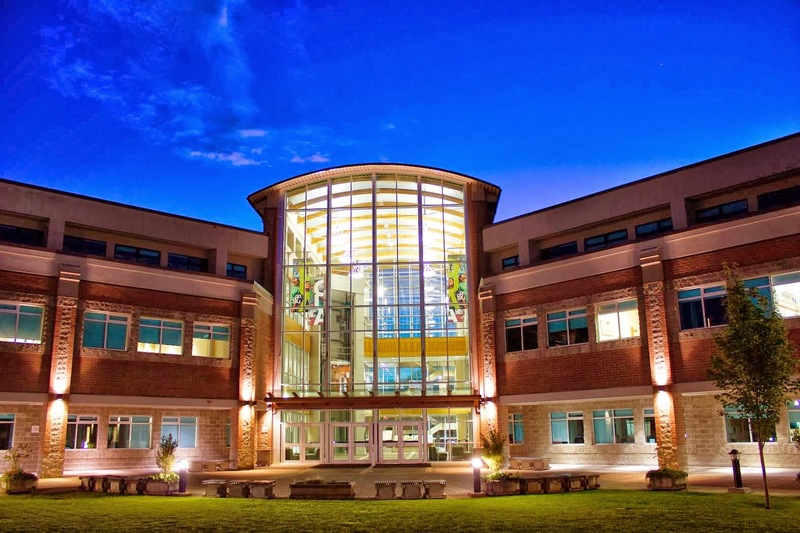 If you’re new to Douglas, you’ll find it easy to navigate, search for programs of interest, sign up for information sessions, or apply to the college. Existing students will experience the same benefits, in addition to being able to locate resources and services more easily. A new filterable, searchable Program and Course Catalogue (formerly known as the Calendar) is designed to make it easier to find programs and courses of interest. Once you’ve picked a program, you can use the tabs to find out more information, including the costs associated with the program, and the curriculum, which links you to the individual courses. The courses tab will show details on individual courses – including the course schedule and availability, as well as transferability to other institutions. You can still use the Course Scheduling Tool to help build a draft schedule for registration. You can find it in the Register page, as well as under Important Resources. Our website is now optimized for both tablets and smart phones, to improve your mobile experience. No more pinching and pulling! The website’s structure has been changed to make it easier to find what you’re looking for. This may mean that things have moved. Please use the megadropdown navigation list and site search to find the new location for your resources. Some common resources related to studying at Douglas are now found under Study at Douglas/Important Resources in the main navigation megadropdown list. The SEARCH function in our website is tied to Google. It takes several days, and sometimes longer, for all the pages to be fully indexed by Google. Search results on the website for the first few days may be imperfect. We apologize for any inconvenience and ask for your patience. Some links and bookmarks may break in the transition between websites. In many cases, this may mean changing your bookmarks for frequently used pages. This week at Douglas College: Exam Jam, Spring concert series and more! Enjoy An Evening of Jazz at part of the Spring 2014 Concert Series. More info here. 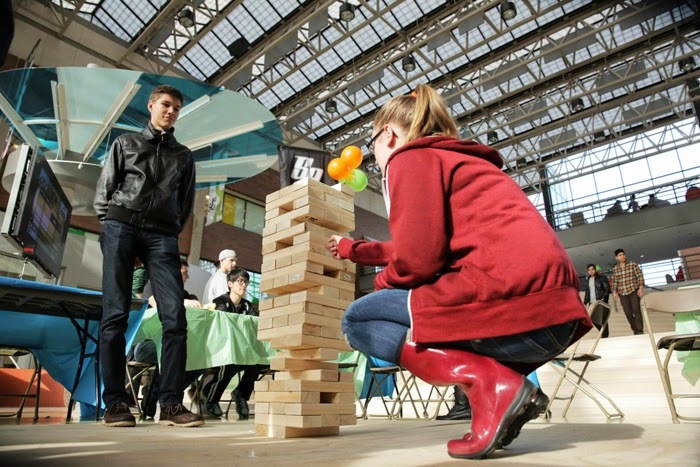 Check out the Exam Jam kickoff featuring Bhangra dancing, giant Jenga, video games and more. More info here. Enjoy performances of new compositions by students. Free admission. More info here. The Music Department presents Current Sound Waves III, featuring students from the Music Technology Certificate Program. More info: email or phone 604 527-5723. There's always something we can do to make ourselves healthier and happier. To help inspire some of those positive changes, the Douglas College Health Fair visited the New Westminster campus on March 26. Check out this video for a look at the fair's booths and activities.